There was an article in the paper yesterday about the native meadow planting by the EPA building on the eastern edge of town, so I thought I'd go out there and see how it was coming along. They've really done a nice job keeping the invasives out, and I'm impressed that they've done it with minimal chemical use. (On the Wild Ones e-mail list that I'm on, it is often debated whether or not it is acceptable to use judiciously applied Round Up to battle European buckthorn, garlic mustard, et al. I have to admit I'm undecided.) I don't know my grasses well enough to know what's native and what's not, but of the flowers I saw, they were very nearly all native. In bloom now are mostly bergamot and black-eyed susans, with some silphium, goldenrods, and asters. A sunny northland field in the autumn without tansy—imagine that. The only obvious non-natives I saw were some birds-foot trefoil and various clovers, and they were almost exclusively at or near the mown edge near the sidewalk. What does this teach us about ecology? Most weeds are not as cosmopolitan as you might think; they do not grow everywhere. Look up clovers, creeping charlie, dandelion, thistles, bindweed, etc., in a field guide, and for habitat they'll all list the same thing: disturbed soil, waste areas, and lawns. There are exceptions—the aforementioned buckthorn and garlic mustard among them—but most of the plants that we think of as weeds are designed to take advantage of weakness, to thrive in poor soil or harsh conditions. They're the plants that, in their natural environment, would be the first to move into an area after a fire or landslide. They have a short life cycle so that they can grow, make flowers, get pollinated, and put out seeds before getting grazed (or, more often in modern contexts, mown), or they spread in other ways, by putting out runners underground. A lot of weeds in North America, actually, including clovers, were purposefully brought over here from Europe to be grown as cattle fodder. The reason they're so hard to eradicate from lawns is because that's exactly the kind of environment they thrive in. 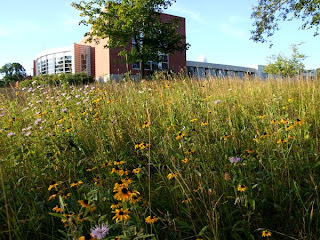 If you do something like what the EPA did, and pull or spray the worst of the invasives, plug in some strong prairie plants, and just stop mowing, over time the weeds will just remove themselves, because they can't compete with the likes of silphium and susans. I've noticed this in my own tiny garden. Last year I dug a new flower bed and put in some bee balm (another monarda, related to bergamot), black-eyed susans, and hyssop. The first year the natives were a little sparse and I had to pull a lot of weeds, and I planted some non-native annuals just to fill in the open space so that it wouldn't look so bare. This year the bee balm just *exploded* and completely took over, and the susans and hyssop are filling in any space that the bee balm didn't. I've even had a few new volunteers, some bergamot and some wild geraniums that I didn't plant but they just showed up. The seeds could have just blown in, or they could have been waiting in the soil for years for the right conditions to germinate. 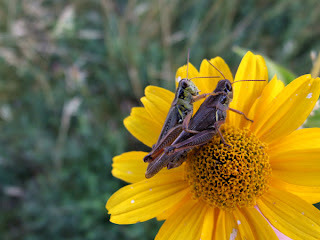 Natives plants are better for wildlife and insects, too, and at the EPA meadow I found these two grasshoppers. Although to be honest I don't think these particular grasshoppers really cared what kind of flower they ended up on just at the moment.